The Ripple Board Everest Scratch Box is a refillable, angled Scratch Box with Cat Toy. 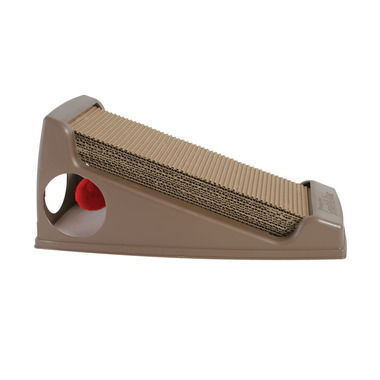 The base is made of plastic that holds the cardboard scratching pad at a comfortable scratching angle. Three large holes at the base make it easy for cats to play with the springing pom pom toy that comes with the Everest. You can replace the worn-out cardboard with the Omega Paw Ripple Board Scratch Box. The Ripple Board Scratch Box slides into the Everest once the used cardboard is removed.